A total of 220 patients with idiopathic chronic neck pain were randomly assigned to receive 5 mg amitriptyline or placebo at bedtime for 2 months. Low-dose amitriptyline may be safe, tolerable, and effective for reducing neck pain, disability, and sleep disturbances in patients with idiopathic or nontraumatic chronic neck pain, according to study findings published in the European Journal of Pain. A total of 220 patients with idiopathic chronic neck pain were randomly assigned to receive 5 mg amitriptyline (n=112) or placebo (n=108) at bedtime for 2 months. Changes in pain scores at 2 months assessed with the visual analog scale (VAS) were the study’s primary outcome. Secondary outcomes were patient satisfaction, changes in the Neck Pain Disability Index, Bergen Insomnia Score, and Hospital Anxiety and Depression Scale from baseline to the end of treatment. Compared with participants receiving placebo, those receiving 5 mg of amitriptyline reported lower VAS scores at the 2-month follow-up (6.12±0.92 vs 3.34±1.45, respectively; P <.0001), corresponding to a 53.06%±20.29% vs 14.41%±11.05% improvement in pain from baseline levels, respectively (P <.0001). Neck pain disability was also improved in the amitriptyline vs placebo group (42.22%±15.50% and 13.69%±9.55%, respectively; P <.0001). In addition, patients receiving active therapy reported higher treatment satisfaction compared with the control group (54.85%±21.34% vs 16.99%±9.85%, respectively; P <.0001), greater improvements in insomnia (34.89%±22.98% vs 6.02%±12.38%, respectively; P <.0001), and greater improvements in Hospital Anxiety and Depression Scale scores (11.47%±13.35% vs 2.95%±11.47%; P <.0001). Eight patients (7.14%) receiving amitriptyline withdrew from the study because of drug intolerance. The short follow-up period may not allow determination of long-term benefits of amitriptyline doses in patients with chronic neck pain. 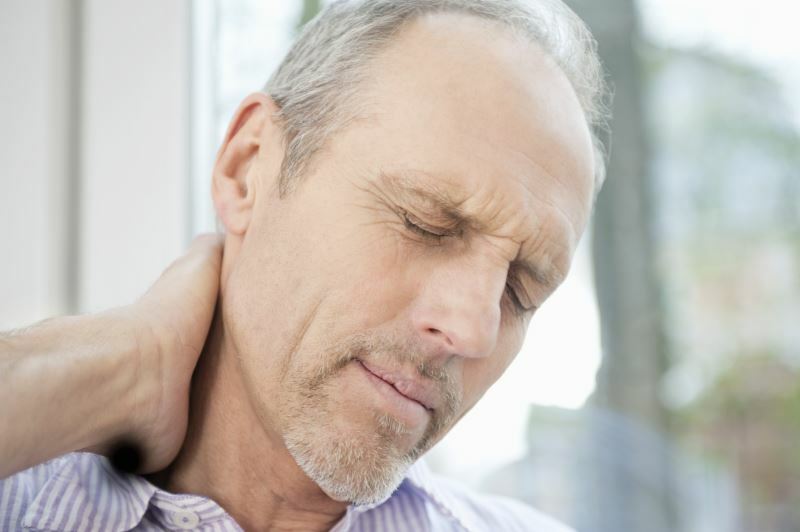 In addition, exclusion from the study of patients with generic degenerative changes and nonspecific neck pain precluded the assessment of the therapy in this patient population. ”Because of its low cost, these results may renew clinical and economic interests in this drug,” concluded the study authors.